Defending champion Stan Wawrinka beat Kei Nishikori 6-3 6-4 7-6 (8-6) to set up a semi-final with Novak Djokovic. "It was definitely kind of a flashback to Wimbledon for me," she said. "I have had some problems with that part of my leg, so it was kind of an overwhelming moment. "It was kind of scary but luckily I was able to catch it before I did any real damage to it." Serena Williams fired down 15 aces in a comprehensive 65-minute win over last year's finalist Cibulkova. Novak Djokovic was not exactly short of upsides to his game, but the world number one appears to have added an impregnable serve to his armoury. The Serb has dropped just one of his 73 service games in five matches and acknowledged the influence of his coach, once known as 'Boom Boom' for his own legendary serve. "I feel like Boris Becker on the court," Djokovic joked, before adding: "Definitely he's got his contribution there, no question about it. "He has joined the team last year. It's been 12 months that we've been working together. Serve was one of the tasks, one of the things that we wanted to improve." 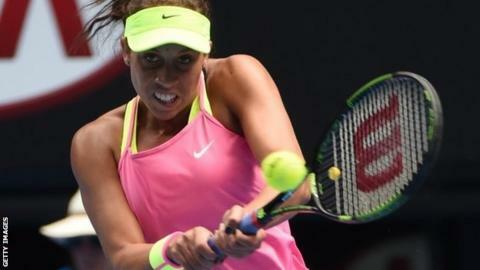 Madison Keys drew on the experience of her coach, former world number one Lindsay Davenport, as she battled past seven-time Grand Slam champion Venus Williams. Davenport and Williams met 27 times, with Williams edging the head-to-head 14-13. "Lindsay obviously played Venus a couple of times," Keys said. "She was just saying that she's going to have great serves; she's going to have great shots. "It's one of those things where when she starts playing really well, you can't panic or get too far ahead of yourself." Serena Williams might not have looked in much distress as she powered past Dominika Cibulkova, but the top seed is struggling. Speaking with a gravelly voice, the 18-time Grand Slam champion said: "I've felt better, but I'm feeling OK. I'm just happy to still be in the tournament. I definitely have a little raspy voice. Hopefully I'll get better. "I've been sick the past few days. It's just getting worse and worse. But hopefully it will start getting better. "I heard it's a virus going around with a lot of the players. I think I caught it." Dom Inglot and Romania's Florin Mergea could not back up their win over the Bryan brothers as they lost 6-4 7-6 (7-3) to Jean-Julien Rojer and Horia Tecau in the quarter-finals on court two. There was better news on court 21, where Britain's Katie Swan beat Chinese top seed Shilin Xu to reach the girls' quarter-finals. "I had a pretty clear strategy of what I wanted to do and thankfully it worked pretty well," said the 15-year-old, who is from Bristol but based in Kansas with her family. "My dream is to be number one in the world, just as I'm sure everyone's is at my age in this tournament. But I'll take everything one step at a time and see what happens." "Like everyone he has the need to go to the toilet but not in the first game of the third set Boris, please." Novak Djokovic did not miss coach Becker slipping out of Rod Laver Arena. "Personally I was kind of thinking I would really like to be in the semi-finals." Madison Keys is not too distraught to miss out on seeing an all-Williams match on Thursday. "I think that's the last thing I think. Is that what you were thinking? No, I don't think things like that. I look within." Venus Williams does not regret being an inspiration to the young Keys. "She just didn't give me any time to breathe on the court." Dominika Cibulkova was well and truly under Serena Williams's spell in their quarter-final. "I'm not involved in mystics or magic, nor have I ever went to Hogwarts." Serena Williams puts everyone's mind at rest. "Everybody is going to be tough from now because everybody is coming with over 100%." Kei Nishikori is finding life tough at the top. Andy Murray ended Australian interest in the men's singles when he beat Nick Kyrgios in the quarter-finals on Tuesday. But the 19-year-old and his fellow Australians did have something to smile about later in the day when Australia beat the United Arab Emirates in their Asian Cup semi-final. "I can't wait for @Socceroos to fire it up again," tweeted Kyrgios.